Where good science matters . . . and it’s all relevant | A balanced diet . . . It was early November. However, I can’t remember which year. It must be well over a decade ago. I was on my way to a scientific meeting in the USA – via Kuala Lumpur where I’d been invited to participate in a workshop about intellectual property rights. My flight from Manila arrived quite late at night, and a vehicle and driver were sent to KL airport to pick me up. On the journey from the airport my driver became quite chatty. He asked where I was from, and when I told him I was working in the Philippines on rice, he replied ‘You must be working at IRRI, then‘ (IRRI being the International Rice Research Institute in Los Baños in the Philippines). I must admit I was rather surprised. However, he had once been the chauffeur of Malaysia’s Minister of Agriculture. No wonder then that he knew about IRRI. IRRI’s reputation has spread far and wide since its foundation in 1960, and IRRI is now one of the world’s premier agricultural research institutes. Its reputation is justified. 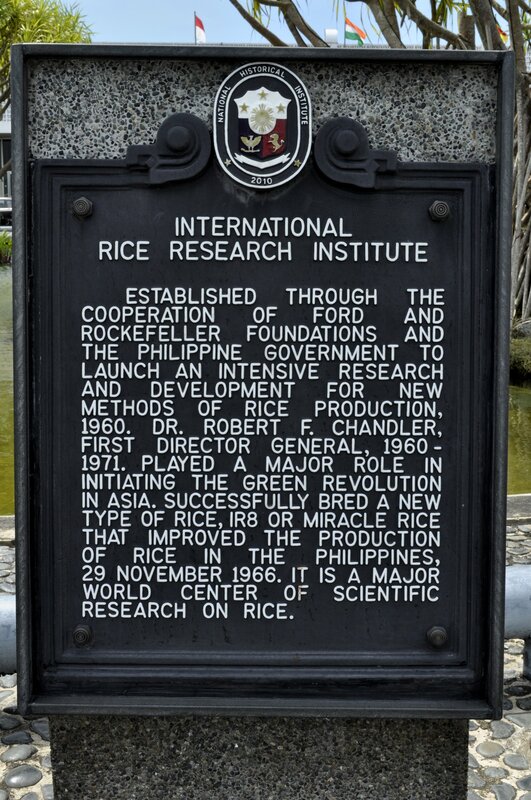 At the forefront of technologies to grow more rice and more sustainably, IRRI can be credited with saving millions of people around the world from starvation, beginning in the 1960s with the launch of the Green Revolution in Asia (see a related story about Green Revolution pioneer, Norman Borlaug). Now its work touches the lives of half the world’s population who depend on rice every day. No wonder IRRI is such an important place. But over the decades it has had to earn its reputation. I was there recently, exactly three years after I had retired. And the place was buzzing, I’m pleased to say. There was such an optimistic outlook from everyone I spoke to. Not that it wasn’t like that before, but over the past decade things have moved along really rather nicely. That’s been due not only to developments in rice research at IRRI and elsewhere, but also because the institute has had the courage to invest in new approaches such as molecular genetics as just one example, and people. That was an aspect that I found particularly gratifying – lots of young scientists beginning their careers at IRRI and knowing that it will be a launching pad to opportunities elsewhere. I was visiting in connection with the 4th International Rice Congress that will take place in Bangkok, Thailand during the last week of October 2014. I’ve been asked to chair the committee that will develop the scientific conference. We expect to have a program of more than 200 scientific papers covering all aspects of rice science and production, as well as a number of exciting plenary speakers. 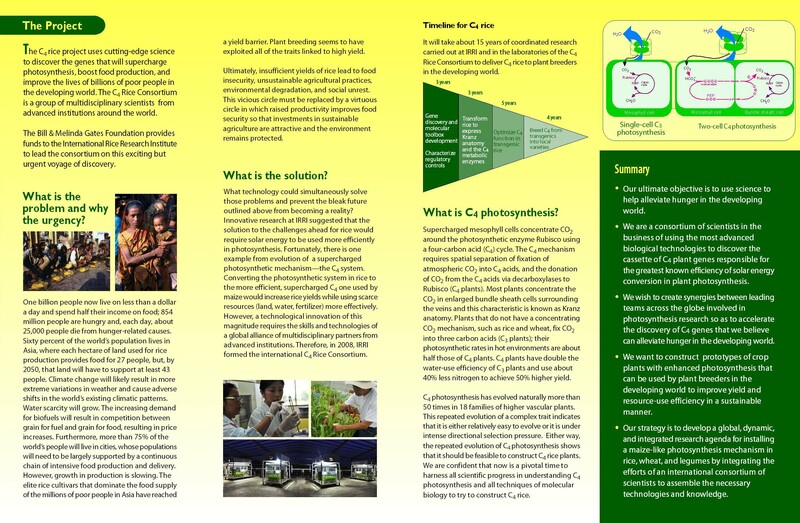 You only have to look at IRRI’s scientific publication record – and where its scientists are publishing – to appreciate the quality of the work carried out in Los Baños and at other sites around the world (primarily but not exclusively in Asia) in collaboration with scientists working in national research programs. IRRI’s soon-to-retire senior editor Bill Hardy told me during my recent visit that by the beginning of May this year he had already edited more journal manuscripts than he did in the first six months of 2012. And IRRI has a very good strike rate with its journal submissions. IRRI’s research is highly relevant to the lives of rice farmers and those who depend on this crop, ranging from the most basic molecular biology on the one hand to studies of adoption of technologies conducted by the institute’s social scientists. It’s this rich range of disciplines and multidisciplinary efforts that give IRRI the edge over many research institutes, and keep it in the top league. IRRI scientists can – and do – contemplate undertaking laboratory and field experiments that are just not possible almost anywhere else. And it has the facilities (in which it has invested significantly) to think on the grand scale. For example, it took more than 30,000 crosses with a salt-tolerant wild rice to find just a single fertile progeny. And in research aimed at turbocharging the photosynthesis of rice, a population of 1 million mutant sorghum plants was studied in the field, with only eight plants selected after all that effort. Both of these are discussed in a little more detail below. In 2012, IRRI made its 100,000th cross – rice breeding remains a mainstay of the institute’s work, keeping the pipeline of new varieties primed for farmers. Take a look at this 11½ minute video in the skies above IRRI’s 252 hectare experimental farm. In the first few minutes, the camera pans eastwards along Pili Drive over the institute’s main administrative buildings, before heading towards the research laboratory and glasshouse complex. In the middle sequence, with the Mt Banahaw volcano in the distance (due south from Los Baños) you can see the extensive experimental rice paddies with rice growing in standing water. In the final segment, the camera sweeps over the ‘upland’ farm, with dormant Mt Makiling in the distance, and showing the multiplication plots from the International Rice genebank, before heading (and closing) over the genebank screen houses where the collection of wild Oryza species is maintained. It’s certainly an impressive sight. You can’t get much longer-term than conservation of rice genetic resources in the institute’s genebank. 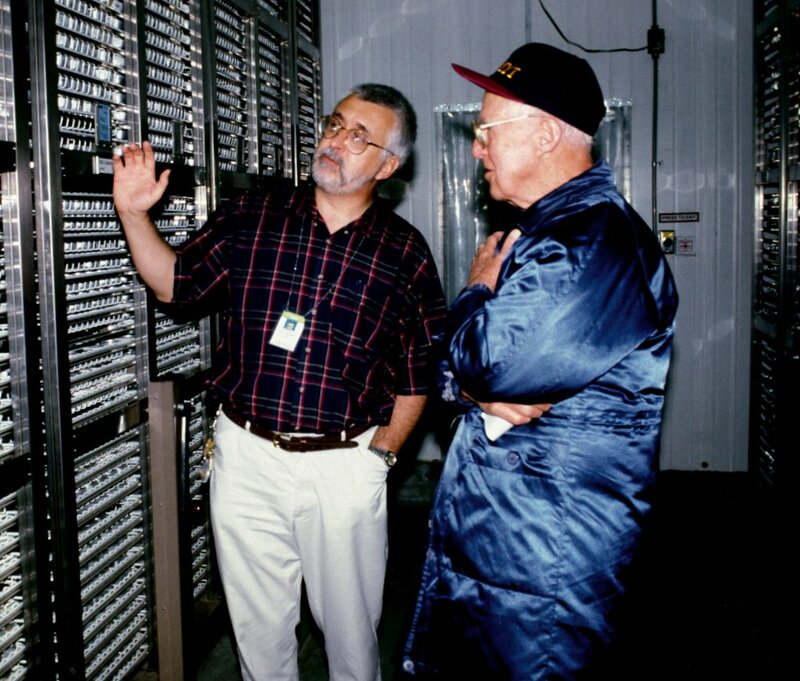 This is the world’s largest collection of rice genetic resources, and I was privileged to head the genebank and genetic resources program for a decade from 1991. I’ve written about this in more detail elsewhere in my blog. In 1963 (just three years after IRRI was founded) long-term experimental plots were laid out to understand the sustainability of intensive rice cropping. In these next videos soil scientist Dr Roland Buresh explains the rationale behind these experiments. They are the tropical equivalent of the Broadbalk classic experiment (and others) at Rothamsted Experiment Station just north of London in the UK, established in the mid-19th century. And in this next video you can watch a time-lapse sequence from field preparation to harvest of two crops in the long-term trials. Three areas of work are closely linked to the problem of climate change, and highlight how IRRI is at the forefront of agricultural research. Scuba rice. Although rice grows in standing water, it will die if inundated for more than a few days. But several years ago, a gene was found in one rice variety that allowed plants to survive about two weeks under water. In a collaborative project with scientists from the University of California, the gene, named SUB1, has been bred into a number of varieties that are grown widely throughout Asia – so-called mega-varieties – and which are already bringing huge benefits to the farmers who have adopted them in India and Bangladesh. In this video, the effect of the SUB1 gene can easily be seen. Much of the work was supported by the Bill & Melinda Gates Foundation, and has (as stated on the Foundation’s web site) ‘exceeded our expectations’. Careful with the salt. 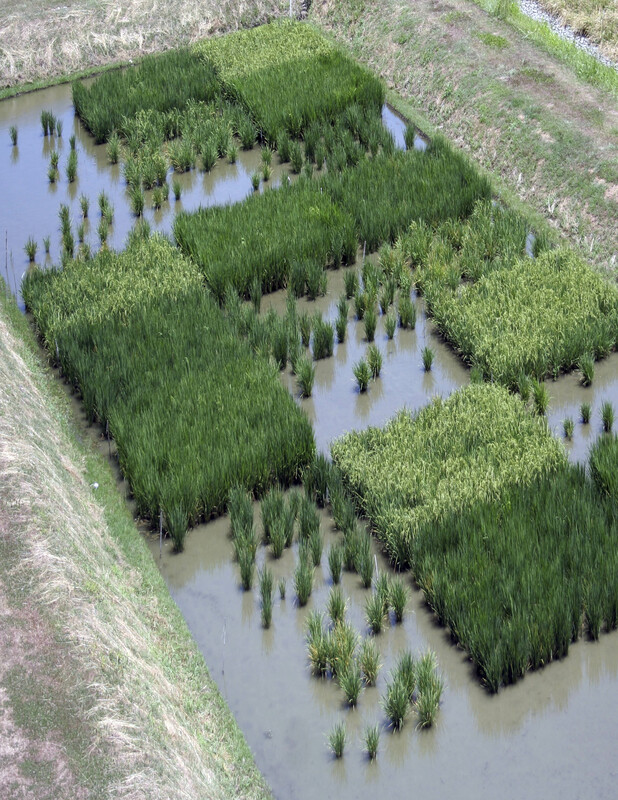 Recently, IRRI announced that breeders had made crosses between a wild species of rice, Oryza coarctata (formerly known as Porteresia coarcata – which already indicates how remote it is from cultivated rice) to transfer salt tolerance into commercial varieties. Building on the wide hybridization work of Dr Darshan Brar (who retired in 2012), Dr KK Jena has achieved the impossible. After thousands of crosses, and culture of embryos on culture medium, he now has a plant that can be used as a ‘bridge species’ to transfer salt tolerance. As IRRI Director General Bob Zeigler explained to me, ‘Now we have fertile crosses with all the wild rices, we can tap into 10 million years of evolution‘. I couldn’t have expressed it better myself! Boosting output. Lastly, since 2008 IRRI has led the C4 Consortium, a network of scientists around the world who are studying how photosynthesis in rice (which is quite inefficient in an environment where temperature and CO2 levels are increasing) could be modified to make it as efficient as maize or sorghum that already have a different process, known as C4 photosyntheis (just click on the image below for a full explanation). This work is also funded by the Bill & Melinda Gates Foundation and the UK government. There are so many examples I could describe that show the importance and relevance of IRRI’s research for development. I think it’s the breadth of approaches – from molecule to farmer’s field (it’s even working with farmers to develop smartphone apps to help with fertilizer management) – and the incredible dedication of all the people that work there that makes IRRI such a special place. Now part of the Global Rice Science Program (GRiSP) funded through the CGIAR Consortium, IRRI’s work with a wide range of partners goes from strength to strength. There’s no doubt about it. Joining IRRI in 1991 was the second best career decision I ever made. The best career move was to get into international agricultural research in the first place, way back in 1971. What a time I had! This entry was posted in IRRI, On my mind . . ., Science and tagged CGIAR, climate change, genetic resources, IRRI, Philippines, rice.